The ASIS - Airborne Surveilance and Intelligence System - is a combination between the advantages of an unmanned system to manned air vehicle capabilities. The ASIS consists of a light airplane which carries an EO/IR payload and Innocon's unique ground control station. • Guidance of attack forces and battle field control. • Involving the high command in tactical decisions. • Targeting and coordinating attack on enemy force. • Rapid deployment, airborne observer can start performing a mission while GCS is deploying towards battle zone. 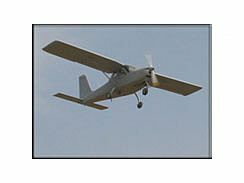 • Extremely low cost relative to UAV systems. • Operate at low altitude under clouds if necessay and then climb back in order to transmit data to GCS. • Wide angle view of the battle field by the airborne operator and pilot. • Mission Avionics for navigation and payload command & control. receiving commands and voice from the ground station to pilot, payload and avionics. • Inside of a light truck. • Display and record video images.